Now that the analog sun has set, the days of housewide HD video over component cabling are over, done, kaput. Now that the analog sun has set, the days of housewide HD video over component cabling are over, done, kaput. And if legislation weren’t enough to inform you of this, one look on the back of modern receivers and source components will tell you that other connections are disappearing, and HDMI is the connection for the here and now and likely the foreseeable future. Of course, millions of existing systems that weren’t wired with HDMI cabling are sitting out there, and no magical finger-snap cabling switchover solution exists for these installs. And at some point, a component will break, and the customer/installer will be forced to add some new component that won’t work with the existing cabling. Forget about existing installs for a second; what about the times in new construction, or even when you can retrofit new wiring, where the electronics are located a hundred or more feet away from the display device. What’s an HDMI-length-challenged installer to do? Fortunately in the world of custom installation there is almost always a solution to these problems, and this month I’m taking a look at two different approaches to solving these HDMI challenges from a company called KanexPro. First up was the WHDI30M ($375). This is a wireless HDMI system, and I was interested to see how it compared to the Peerless HD Flow solution I reviewed in June 2011. While the name might lead you to believe it has a 30-meter range, it is actually rated at 15 meters (or 50 feet for the metric challenged). The install could not have been simpler; I connected a Kaleidescape M300 Blu-ray player via HDMI to the WHDI30M transmitter and connected the receiver to my Marantz prepro via another HDMI cable. I powered both units on and, voila! I had picture and sound! There were no sync buttons to press or other mating/pairing song and dance to perform. The receiver has a built-in IR receiver, and the transmitter has a mini-jack connection for an IR emitter (included) to relay control signals back to the source. I found the IR operation spotty; it worked fine for a while then just stopped. I would reboot the receiver, and it would work again and then stop. Audio-wise, the system transmitted DTS and Dolby Digital bitstream signals just fine, but converted lossless (DTSHD, Dolby True HD) streams to two-channel PCM. Picture wise, it looked outstanding. I never noticed any quality differences when watching actual video, and only the chroma multiburst and upsampling patterns on the Spears & Munsil HD Benchmark Blu-ray revealed any differences from a direct cable connection. The unit does run hot, and it is recommended that you stand it vertically not lay it flat. I had one lock-up issue that seemed to be attributed to heat, and changing the orientation resolved this problem. Next up was the HDBase100MSEW ($450), also called the Long-Runner Extender. 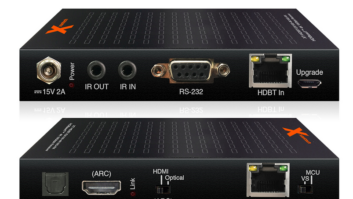 This utilizes the newish HDBaseT technology that is optimized for housewide AV distribution. Most compelling about the HDBaseT story is that it sends full-resolution, uncompressed AV signals along with 100BaseT Ethernet and control signals up to 100 meters (330 feet) over a single Cat-5e wire with a standard RJ-45 connector. Since most homes include Cat-5 wiring (even if just for the phones) there is a high likelihood that an installer could “rob” a cable to retrofit. I grabbed a spare 280-foot spool of Cat-5e, terminated it, and connected both ends into the ports labeled “HDBaseT” on the Long-Runner transmitter and receiver. There are three additional RJ-45 connections on each unit that can act as a network local switch. This is a handy feature for when additional devices crave internet access. Once I connected my Kaleidescape player to the transmitter and the receiver to my Marantz and powered up the devices, they again just found each other and started working. A “Link” and “HDCP” LED light on both units confirmed a successful pairing, and so did the perfect picture on my plasma. The IR pass-thru control was much more consistent and reliable than on the WHDI30M and didn’t exhibit any delay or lag. The included IR emitter does have an odd shape and uses a smaller-than-typical one-eighthinch mini-jack connection. I started my testing by watching some Blu-ray clips, and picture and sound were both pristine. The unit passed all high-res audio formats, and viewing test patterns confirmed that picture quality equaled that of a straight HDMI cable connection. Other than the spool of cabling on my floor, I would have never known anything was out of the ordinary. Installers are frequently looking for MacGyvertype, “rescue me from this nightmare” problem solvers, and these KanexPro devices seem to deliver. The WHDI30M would be the perfect solution when adding an HDMI to a projector/ flat-panel would seem otherwise impossible, and the HDBase100MSW allows source components to be placed virtually anywhere in even the largest homes. Best of all, you plug them in, and they just work. For installers, there’s nothing better. The WHDI30M very simple to setup and offers virtually identical picture quality as a direct cable connection, and the HDBase100MSW’s picture and sound quality are also as good as a direct cable connection, turning Cat-5e into an inexpensive 330-foot HDMI cable. The WHDI30M runs hot and IR pass-thru feature intermittently stopped working, and the HDBase100MSW has an oddshaped IR emitter and nonstandard emitter connection.